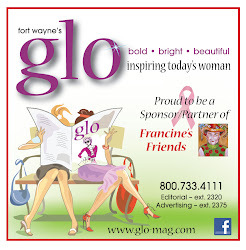 Francine's Friends: Lady Knights Raises $1,300 for Francine's Friends; Honors "Ms. Sue"
Lady Knights Raises $1,300 for Francine's Friends; Honors "Ms. Sue"
The Lady Knights basketball team held a Pink Out on Feb 6 at Bishop Luers. For this last game of the season, they played in honor and memory of Sue Ross, who passed away from breast cancer June 30. "Ms. Sue", as she was fondly called by Emilia and Gabrielle Miles, left monies in her will to purchase pink jerseys for the team to wear. Every year "Ms. Sue" would remind Alice, Emilia and Gabrielle's mother, to have a mammogram done and her husband a prostate screening. 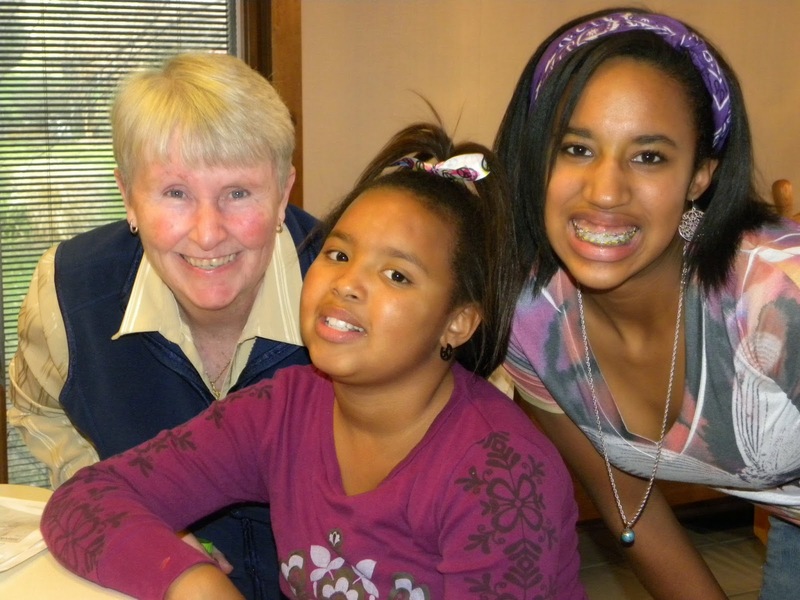 Ms. Sue was a strong advocate of preventative measures as it pertained to breast cancer. Therefore, Emilia and Gabrielle decided to hold a Pink Out and donate the monies raised to go to Francine’s Friends. "Tonight our Lady Knights are trading red for pink in honor of a dedicated women's basketball fan for Luers, Indiana Fever, and Purdue basketball. She was my neighbor for about 11 years and she was my second mom...when Ms. Sue passed away, I lost my best friend, my mentor, my mom, my coach, my cheerleader, my everything. While she was just one of many who had this disease, she was a wonderful woman and she left a huge mark on this world and sepecially on me. I love you, Ms. Sue." Click here to view photos from the game night in February on FB. 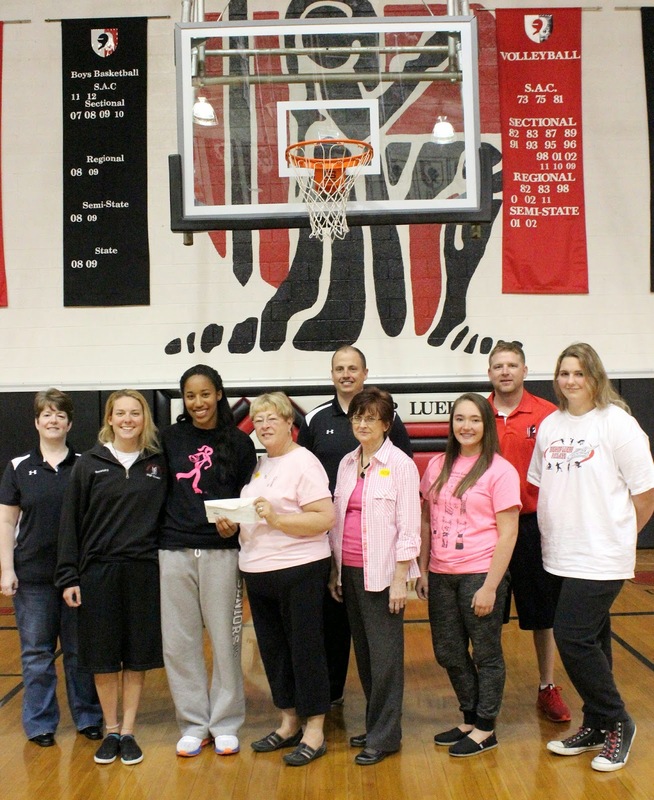 On May 1, Emilia and the Lady Knights presented a check to Francine's Friends in the amount of $1,300. L to r:1st row: Tiffany Albertson, Bishop Luers Principal; Dana Boretzky, Luers senior BB Lady Knight; Emilia Miles, Luers senior BB Lady Knight; Sharon Simmons, Francine's Friends board president; Glynda Harris, Francine's Friends board secretary; Briana Wood, Luers senior BB Lady Knight; and Amanda Rectanus, Luers senior BB Lady Knight. second row; Rick Brown, Bishop Luers Athletic Director and Mark Pixley, Bishop Luers Varsity Lady Knights BB coach. What a wonderful group of young women! Our thanks to all of the Lady Knights, the coaches, players, athletic supports, fans and everyone who participated in "trading red for pink"! You all are incredible!